14kt white gold diamonds and a morganite dome ring. 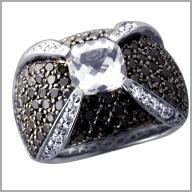 2.5200ct black and white diamonds. A trio of dazzling gemstones that will set your heart aglow. Crafted with polished 14K white gold, this ring features a dome-like design with a flat top that has one cushion cut 7 x 7mm morganite horizontally bezel set in the center. Accenting the center stone are four rows of round cut diamonds set in an "X" design, for a total of 28 diamonds. There are 120 round full cut black diamonds on black rhodium plated bead settings between the diamond rows and along the gallery and shoulders. This ring has a caged back, allowing the brilliance of the gemstones to shine through .The total diamonds weight is 2.5200 ct, the morganite weight is 1.42ct, all approximate. Setting size is 9/16" x 12/16"x 5/16 H.